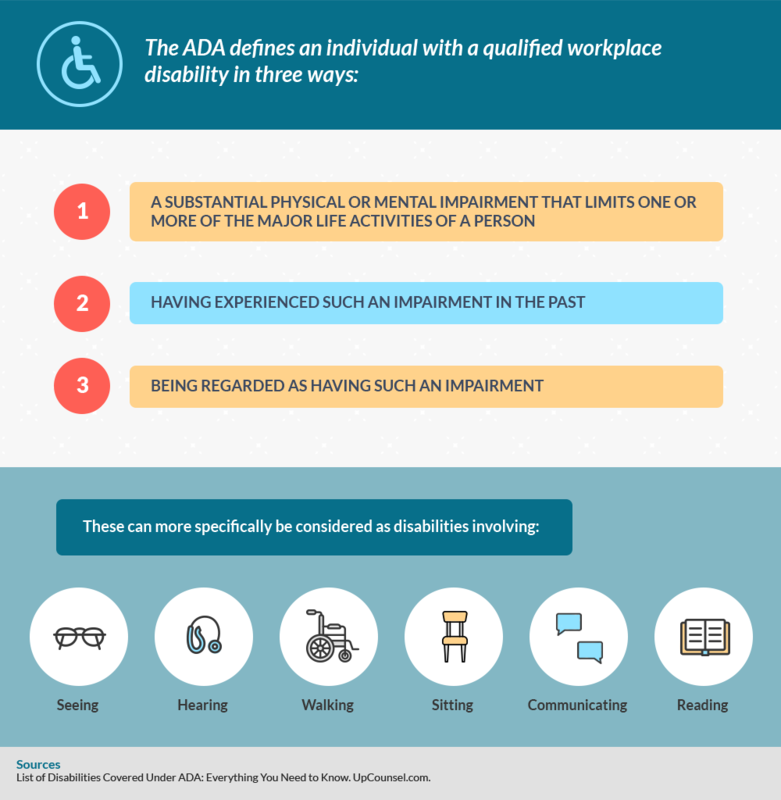 The Americans with Disabilities Act (ADA) was first passed in 1990, and since that year, understanding of differences in physical and mental capabilities has led to several changes in laws and regulations in the ADA. The act began as a step to protect those with disabilities while they traverse different environments in public, such as shops, restaurants, movie theaters, grocery stores, and more. The ADA prohibits discrimination based on disability, which includes negligently limiting access to buildings, education, transportation, employment, and, as of 2010, internet spaces. For example, Title IV is controlled by the Federal Communications Commission (FCC); it mandates that closed captioning is available for federally funded public service announcements. Basically, the ADA states that anyone with a disability is entitled to the same goods and services as people without disabilities, so businesses with storefronts, websites, and personal services must find ways to make their businesses accessible to everyone. Many of the guidelines affect brick-and-mortar businesses, so you as a business owner may be responsible for making sure your establishment meets ADA accessibility criteria. This does not mean just wheelchair ramps, but closed captioning on televisions, adjustments to background music volume, and clarity of written signs. The original ADA Standards of Accessible Design was printed in 1991, with the most recent update being printed as of 2010 by the Department of Justice (DOJ). The DOJ’s involvement makes these updated standards legally enforceable, so it is important to understand them. The most important section, for brick-and-mortar businesses, of the ADA Standards of Accessible Design is clear about the construction of new buildings. Any facility with a section constructed for some level of public use that was built after January 26, 1992 must have construction in place to make the public area accessible to people with disabilities. Many buildings constructed prior to 1992 also need to be retrofitted to meet ADA compliance standards with rare exemptions for clear structural issues or historical registry status. Title III of the compliance regulations is the Standards for Accommodations and Commercial Facilities. The general rule is that buildings must have a way to get in and out of them that people with disabilities can manage, and contain a clear path through the public spaces to the restrooms, drinking fountains, and parking. There are a few exceptions. Commercial facilities inside private residences: The area of the building that is a residence does not need to be converted to accommodate people with disabilities, but the area used by the public must meet new standards. Public areas include spaces that may be managed by the building or homeowner, like sidewalks. Structural impracticability: If the homeowner or facilities manager can demonstrate that making updates to meet new compliance standards is structurally impracticable, such as unique areas of terrain or where support beams must be located, then the building owner should meet as many requirements as possible. For example, if the home cannot accommodate a wheelchair ramp, there must still be changes to accommodate people with crutches or motor disabilities who can still walk. Elevators: These do not need to be installed if the facility is less than three stories tall, less than 3,000 square feet, and/or does not have one or more healthcare providers or shopping centers inside. Otherwise, buildings must have an elevator big enough to accommodate people with disabilities that is accessible through a clear path. Historic preservation: Sites that are designated by the National Register of Historic Places under the National Historic Preservation Act to have cultural significance and heritage must comply with ADA regulations to the greatest extent possible without radically altering or changing the facilities so the cultural and historical significance is damaged. The updated ADA compliance standards go into incredible detail about all kinds of public spaces, from libraries to mini-golf businesses, and how these must provide the greatest possible accessibility for people with physical, mental, hearing, and sight differences. While meeting these standards, however, it is possible to make some basic mistakes. There are several mistakes common to brick-and-mortar business owners regarding various facilities. Accessible entrance: The path from transit, including bus stops and parking lots, must be clear and accessible to people with physical disabilities with no violations including locations of parking spots. Doors must be a minimum of 32 inches wide. Inadequate moving clearance: Doors must be able to swing open with a wide enough clearance for anyone to maneuver around them without being at risk or stuck. Narrow aisles: This includes temporary aisles bordered by velvet ropes. They must be a minimum of 36 inches wide everywhere. Bathroom facilities: Mirror height, grab bars, toilet stalls, sinks, and doors all have specific dimensions and measurements, so they can be used by anyone, including people who have a range of physical disabilities. It is important to ensure that at least one bathroom per gender – which could be a unisex bathroom – meets the requirements. Accessible van spots: Handicapped parking is required in parking lots, and one out of every six of these spots must be large enough to accommodate an accessible van. Doorknobs: There are specific pressure requirements for hardware used to open doors, which are used by the public. Lunchrooms: Countertops must not exceed 43 inches in height and must have a 30-inch-wide clearance for wheelchairs to roll underneath the sink. There are ways to avoid pitfalls when updating or building a facility to be ADA compliance. Don’t make assumptions about disabilities because many are not obvious or overt, such as chronic pain. Go through an official process, and if you do not know what that process is, contact a lawyer or city government official to find out. Document everything you do and how it is designed to work with the ADA regulations. When an employee has a disability, find ways to accommodate their individual needs, as the ADA is clear that a one-size-fits-all approach does not work for employment environments. Digital accessibility is a new point in the 2010 updates, so go through your brick-and-mortar store’s website and any associated mobile apps to make sure they meet compliance requirements. Depending on your business, you may consider changing some in-store policies to provide accessibility to customers who have disabilities. For example, clothing retailers typically allow only one person at a time into dressing rooms; consider updating this to allow for caregivers to go into dressing rooms with someone who has profound mobility issues. Keep enough employees on shift in the business they can reach items on taller shelves for people who may have mobility problems or to describe items to people who have vision difficulties. If no employees know American Sign Language, using written notes back and forth may suffice for transactions. Many businesses do not allow animals into the building, but service animals are a clear exception in many cases. Service animals provide help for people with vision, hearing, physical, and even behavioral disabilities. Communication between employees, the business, and customers who have disabilities is one of the biggest potential pitfalls, which business owners may not consider. There are traditional methods for making communication clear and accessible. Video remote interpreting (VRI) devices, oral interpreters, or employees who know sign language are designed to help customers who are hearing impaired. Fonts should be clear, contrast appropriately with a sign’s background color, and be large enough to be read by people who have profound vision loss. Employees should be available to read information to customers who are blind. Critical information provided over loudspeakers must also be provided in written form and at an accessible volume. Transcripts for multimedia should be available. Design colors can be problematic for people with some types of colorblindness, so critical information must use appropriate contrasting that takes this condition into account. Several kinds of auditory disorders are considered disabilities, and they are therefore protected by the ADA. About 21 to 25 percent of adults in the United States have some type of hearing loss – that is a large section of your potential customers. 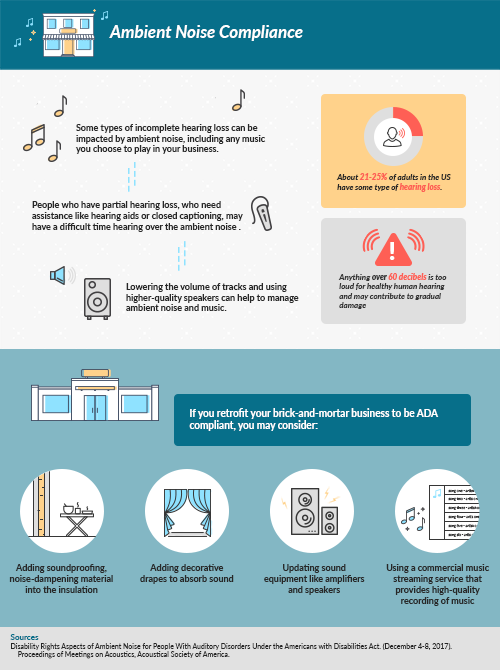 As a business owner, you may provide assistance in the form of written options and text-to-speech devices for your customers who are hearing impaired, but some types of incomplete hearing loss can be impacted by ambient noise, including any music you choose to play in your business. Sometimes, people who have partial hearing loss, who need assistance like hearing aids or closed captioning, have a difficult time hearing over the ambient noise of a restaurant or retail establishment, and this includes any background music that may be playing. The simplest solution to noise problems is to lower the decibel level of any music you play in your establishment. Anything over 60 decibels is too loud for healthy human hearing and may contribute to gradual damage. Lowering the volume of tracks and using higher-quality speakers can help to manage ambient noise and music. Even in people with normal hearing, sound that is too loud can be disturbing. Understanding speech indoors at about one meter distance is around 100 percent for people with average hearing at 55 decibels, 50 percent at 70 decibels, and goes away completely at 75 decibels. People with hearing loss, even if they have some ability to hear, cannot understand speech at 58 decibels; this problem becomes worse in spaces that reverberate. Tinnitus is a condition in which a ringing sound occurs in the ears, and episodes of this can obscure the ability to hear. While there is no common, well-understood cause of tinnitus, the condition impacts 11 to 15 percent of the adult population in the U.S. Tinnitus triggers include loud sounds and specific pitches of sound. If your music is too loud, too high a pitch, or there is too much static interference from low-quality equipment or sound compression, then someone with tinnitus may not be able to remain in your building because their condition will be triggered. Hyperacusis is another auditory condition that is not well understood. This condition causes discomfort from sounds that people with average hearing find acceptable or unnoticeable. Like tinnitus, loud, irregular, or oddly pitched noises – including in music – can trigger the condition and make patrons uncomfortable in your store. As a business owner, you may not be able to control ambient noise from other customers in your establishment, but you can take steps to mitigate noise levels. The Lombard effect, or cocktail party effect, means that crowded establishments, like bars or restaurants, tend to have high ambient noise levels that increase the more people try to speak loudly over each other and any other background noise. Some establishments may turn up music volumes to be heard over their patrons, but this adds to the problem. If you retrofit your brick-and-mortar business to be ADA compliant, you may consider adding soundproofing, noise-dampening material into the insulation or on the walls. Even decorative drapes can absorb some sound and make it less harsh for those moving through your store. Updating sound equipment like amplifiers and speakers can help. Using a commercial music streaming service that provides high-quality recording of music will also help to reduce issues for patrons who have varying types of hearing problems. There are more than 50 million Americans with disabilities. Like any other person in the U.S., these individuals go to restaurants, clubs, shopping malls, grocery stores, retail outlets, and cafes. The Americans with Disabilities Act set out to open public spaces to accommodate the physical and mental needs of people with disabilities, ensuring they can fully participate in public life. It is important not just to consider the needs of any potential customer when you start a business, but to also consider the needs of your employees who may have disabilities. If an applicant’s physical or mental disability prevents them from performing one or more of these job requirements in certain settings, the employer must demonstrate that the skill is essential to the job. For example, working in a warehouse requires the ability to move back and forth, lift heavy objects consistently, and understand some of the organizational process involved. If a person’s physical disability prevents them from lifting a certain amount of weight, then they cannot qualify for this position. However, if an applicant with such a disability applies for a job that involves a lot of sitting and no heavy lifting, their disability will not prevent them from performing that job’s functions. Employers should also make reasonable accommodations for employees who have disabilities when these employees experience worsening symptoms. However, per the ADA, it is up to the employee to request reasonable accommodations for their position. For example, an employee with a chronic pain condition that is getting worse may request to sit in a chair near the sales floor so they can be available to assist customers rather than standing for hours at a time when their body cannot handle this position. In contrast, an employee who has a chronic pain condition and does not inform their employer that this condition is worsening and does not request accommodation may suffer reprimand, poor performance reviews, a performance improvement plan, and, if nothing changes, termination from their job since they are not able to meet the standards expected of them and have not requested adjustments. Employees do not have to request reasonable accommodations within a certain timeframe; however, this gray area highlights the importance of performance reviews prior to disciplinary action or termination. If an employee struggles to perform their job as they have in the past then their employer can reasonably say that they are not performing as expected; however, the employer should meet with the employee to review job performance concerns. During this time, the employee may disclose that they are struggling with a disability. This can lead to a discussion about reasonable accommodation. With storefronts and restaurants, noise – from outside, from chatter among patrons inside, and from in-store music – may be an issue for some employees who have hearing loss, hearing trouble, or behavioral issues triggered by sound. In some instances, being around loud noise may be an expectation of the job, which some individuals with disabilities may not be able to accommodate. However, for many other potential employees, the employer can make reasonable accommodation that will not trigger hearing problems. For example, an employee with severe tinnitus may require quieter music within a certain note or decibel range to avoid having their tinnitus triggered. As a business owner, playing music in your brick-and-mortar store is important to calming or invigorating your patrons, but you can also make changes to your playlist, sound system, and volume or sound mix to accommodate a specific employee’s needs while they are at work. Noise may also be one distraction at work for someone with a psychiatric disability or mental illness. These terms are often used interchangeably, although psychiatric disability also typically covers behavioral disorders. Someone struggling with post-traumatic stress disorder (PTSD), anxiety, bipolar disorders, attention deficit hyperactivity disorder (ADHD), or who is on the autism spectrum may require different types of noise or music, a quieter environment, or even headphones to help them be most effective while they are at work. These are considered reasonable accommodations. Since changes to the ADA in 2010, many businesses have found themselves making sweeping changes to their websites to accommodate new requirements for readability and visual accessibility. As a brick-and-mortar business, you may not assume your website is as important as your physical store, but modern shoppers often refer to online resources before choosing a place to go. They may reference your website, e-commerce platform, or social media while they are in your store. If your online presence does not meet the new ADA standards, you risk potentially losing customers who have disabilities because you have not considered their needs. Web Content Accessibility Guidelines (WCAG) offers suggestions on how to make websites more accessible for people who are hearing- and vision-impaired. For example, many people who have vision loss or who are blind use assistive devices to scan websites. These devices read the content of the website so the person can navigate more easily. If text is not readable by these devices, someone who is blind will not be able to understand what your business offers. People who have any form of color-blindness will have trouble with websites the same way they have trouble in person – certain color combinations will not be visible. 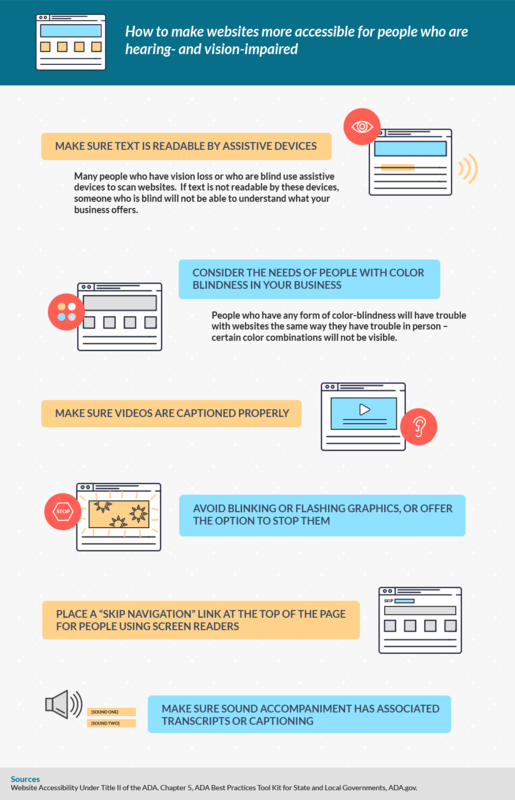 As you consider the needs of people with color blindness in your business, consider those same needs on your website. Videos, slideshows, animated gifs, and other forms of multimedia are becoming increasingly common on websites and social media pages as internet bandwidth and computer processing speeds improve rapidly. However, people who are hearing impaired may not benefit from this sort of content. If you have videos online that are vital to displaying your business, make sure they are captioned properly and have other applicable accessibility features like video transcripts. Avoid blinking or flashing graphics, or offer the option to stop them. Place a “skip navigation” link at the top of the page for people using screen readers. Make sure sound accompaniment has associated transcripts or captioning. Even if the focus of your business is the live experience, the vast majority of patrons use a combination of online presence and in-person environment to determine what they think of your establishment. If they cannot navigate your website, they may not go to your store or restaurant even if you don’t sell anything online. Making accommodations in the digital world is quickly becoming just as vital as making accommodations in brick-and-mortar establishments. Americans With Disabilities Act. U.S. Department of Labor. ADA Compliance: What It Is and Why Your Business Should Care. (May 2, 2016). Anneal, Inc.
2010 ADA Standards for Accessible Design. (September 15, 2010). Department of Justice (DOJ). ADA.gov. Americans with Disabilities Act, ADA Title III Technical Assistance Manual Covering Public Accommodations and Commercial Facilities. ADA.gov. ADA Requirements for Retail Stores: Setting Your Business Up for Success. (April 3, 2018). Crowd Control Warehouse. 6 Common ADA Compliance Issues. LaBarre Associates. 5 Common ADA Bathroom Compliance Mistakes. (May 10, 2018). Buildings: Smarter Facility Management. 6 Must-Haves to Ensure the Workplace Is ADA Compliant. (February 2, 2018). Essential Accessibility. ADA Update: A Primer for Small Business. U.S. Department of Justice, Civil Rights Division, Disability Rights Section. Are Your Mobile Devices ADA Compliant? Adhering to Accessibility Regulations. New Possibilities Group, LLC Blog. Disability Rights Aspects of Ambient Noise for People With Auditory Disorders Under the Americans with Disabilities Act. (December 4-8, 2017). Proceedings of Meetings on Acoustics, Acoustical Society of America. Maintaining Accessible Features in Retail Establishments. (June 2009). U.S. Department of Justice, Civil Rights Division, Disability Rights Section. The Americans with Disabilities Act: Applying Performance and Conduct Standards to Employees With Disabilities. (December 20, 2017). The U.S. Equal Employment Opportunity Commission (EEOC). List of Disabilities Covered Under ADA: Everything You Need to Know. UpCounsel.com. Mental Health Conditions in the Workplace and the ADA. (2017). ADA National Network. Website Accessibility Under Title II of the ADA. Chapter 5, ADA Best Practices Tool Kit for State and Local Governments, ADA.gov.